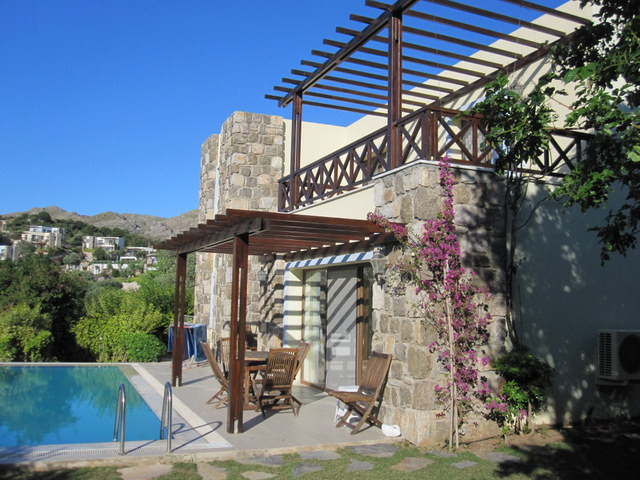 Delightful, detached 3-bed villa with lovely sea views. Private garden, own pool. Walking distance to beach and Gumusluk seafood restaurants. Architecturally designed, in a small luxury development where every attention has been paid to detail. 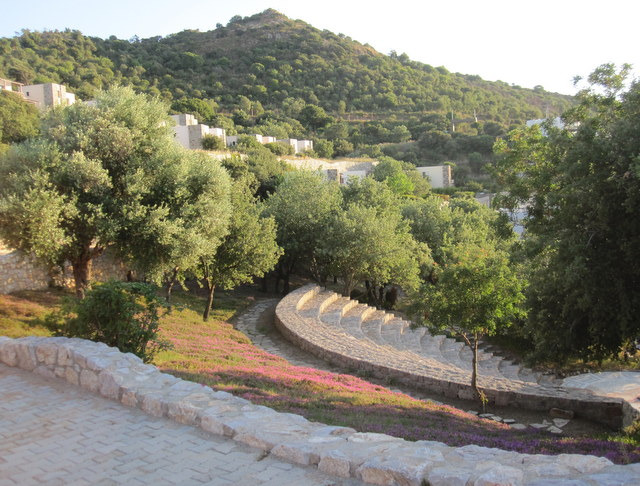 The site has been professionally landscaped with olive trees, shrubs, and climbing plants. It has two large communal pools (in addition to the villa's private one) and even has its own amphitheatre set in parkland! Beautifully designed interior with highest quality furnshings and finish. The private swimming pool (8x4 metres, depth 1.5 metres) is surrounded by landscaped gardens and grassy areas, which benefit from both sun and shade throughout the day. DUE TO IMMEDIATE PROXIMITY OF POOL TO THE PROPERTY, IT IS NOT RECOMMENDED FOR VERY YOUNG CHILDREN. The lounge leads out to a terrace with a large table and comfortable seating area for al fresco dining/ barbecuing. 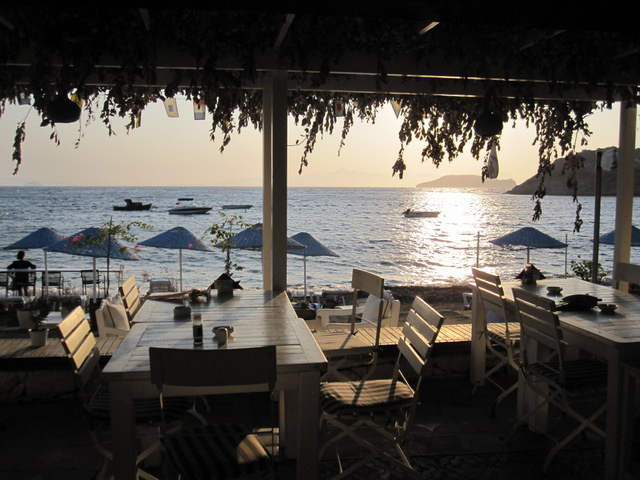 The large balcony upstairs with stylish Rattan armchairs and a sofa is a favourite spot for evening drinks as you watch the sunset over the Greek islands in the distance. Alternatively wander over to the amphitheatre with your glass of wine and enjoy the panoramic views. There is a tranquil walk down an old donkey track to the delightful fishing village of Gumusluk with its unspoilt beach and famous seafood restaurants. Follow the pathway along the beach and discover the ancient city of Myndos with its mosaics and ruins, partly submerged beneath the bay. Why Gumusluk? Why this Villa? We were enchanted by Gumusluk on one of our first holidays abroad, way back in 1990. And the villa? The build is very high quality, the development is small and is set amidst parkland with an amphitheatre. It was still under construction when we first saw it in April, but by August it was transformed, exceeding all our expectations! Even the photos don't do it justice: you really need to go and see it for yourselves. Another lovely stay in the villa in late August - our third visit in as many years - and everything remains in excellent order. This villa provides an comfortable base from which to explore the local area (we hire a car, and there are some lovely beaches within easy drive), or just somewhere to relax by the pool (the parasols are a great addition!). Gumusluk village remains as picturesque as ever: the variety of restaurants remains hard to beat, and the standard of food everywhere we ate was very high (prices seem to be creeping up, but remain on the right side of good value). This feels a very safe part of the country, and we would not hesitate to return or recommend the villa and the Gumusluk area. Thank you Phil. So glad to hear you had another enjoyable stay at the villa. This is our third time staying at the villa and we just love it. Facilities excellent with everything you need to make your holiday comfortable. 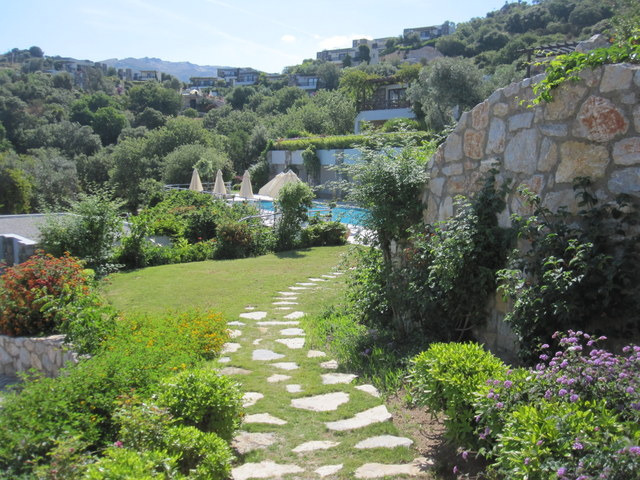 The villa is spotlessly clean and the garden well-maintained. The pool is lovely and the garden very private for sunbathing and relaxing. Local area fantastic with a local market on a Wednesday selling delicious local produce and local restaurants all within a short walk or taxi ride home (very cheap). The restaurants cater for a range of budgets and are all charming. We will certainly return next year. There is really nothing negative at all about this villa or about Gumusluk. Thanks Ian. So pleased to hear you enjoyed another holiday at the villa. 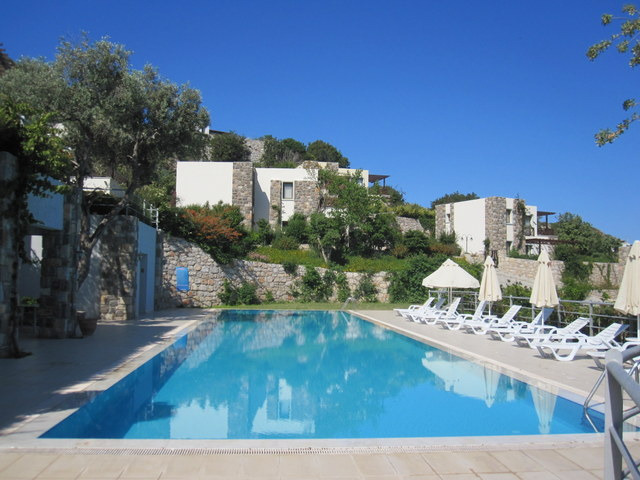 We have just returned from our second trip to this villa, and cannot recommend it more highly. Located in a prime yet private position, the villa is exceptionally well pro-visioned and comfortable. The villa gets direct sunshine throughout the day, but effective air conditioning and, of course, the pool, means that the heat is never a problem. Very easy to self-cater - nearest supermarket is less than 5 minutes drive away, and there is an excellent food market in the village each Wednesday. The fishing village of Gumusluk is a short drive or stroll from the villa, with a range of quality restaurants to suit all budgets and tastes. The village is small enough such that even on a busy evening, it never feels packed - and importantly the majority of the people are local. 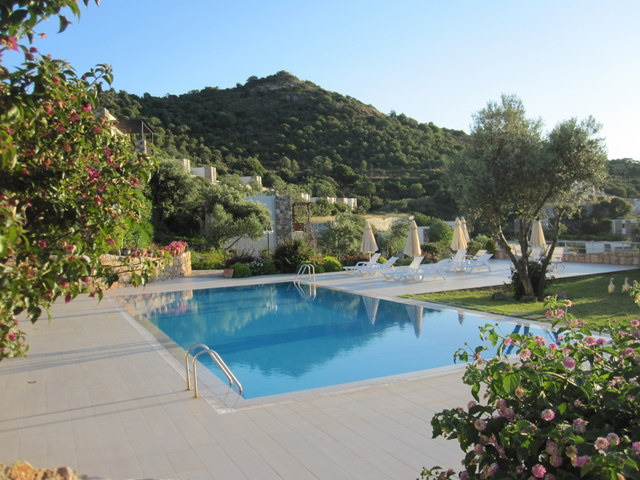 This is a superb villa with everything you need to have a very comfortable and relaxing stay in Turkey. The privacy of the garden and the pool mean you can spend days relaxing and reading. The local restaurants are great value and serve delicious food. We have been before and will go again! 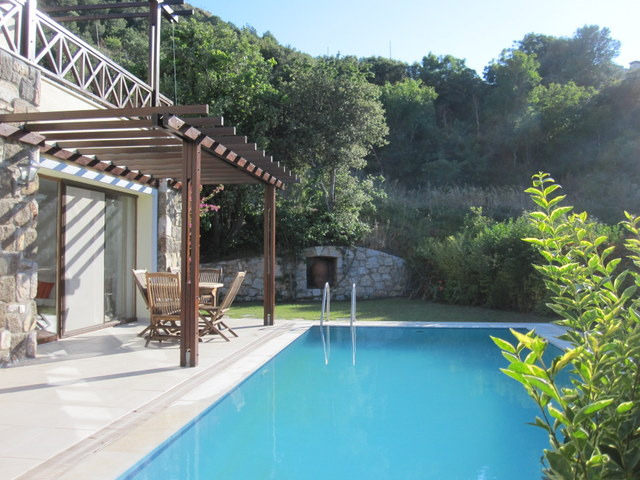 Very good accommodation with excellent pool. Friendly and communicative owners. Lots of extra items freely available for use such as beach towels, snorkels, books, DVDs and endless crockery and glasses to mention but a few, providing a very homely feeling. Wifi rather intermittent, but good access around site office pool within 100 yards. Site staff very accommodating. Would definitely recommend hiring a car. A very relaxing and enjoyable holiday. Gumusluk Villa is a really nice holiday villa, spacious, good size pool, no clutter, clean and nearly everything works that should work ( exceptions being fridge that is being fixed or replaced and wifi that was patchy). Things I especially liked about the villa include: ability to see the sea from master bed, pool big enough to swim in, lots of space, close to Gumusluk which is the nicest part of the Bodrum peninsular by some margin, quiet, lovely flowers in hedges around the garden, sleeps six comfortably and the villa is generally well designed. We were very impressed by the villa and its location. Air conditioned rooms, magnificant views, al fresco dining and private swimming pool all added to the ambience. Relatively easy access(via donkey track) to the beautiful fishing village of Gumusluk with its many water side restaurants, beaches, fascinating market and friendly people added to the enjoyment of our holiday. Within a short drive to Bodrum and possible trips to Ephesus, several Greek islands and Pamukkale, this is a desirable spot for the perfect holiday. Enjoyed walking to village- very pretty bay with delightful restaurants. Villa spacious,very clean, nicely furnished and very well-equipped. Own pool made a real difference and lovely patio setting for evening meals. 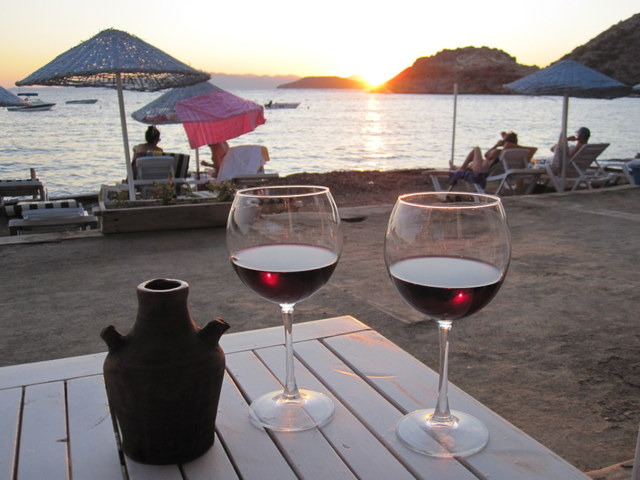 Sunsets from amphitheatre were spectular on some evenings, especially when we took a bottle of wine with us!! Sunbeds are available. There is a Jacuzzi bath in the upstairs bathroom. 6 Beach Towels are available for guests use ( please wash after use) also a selection of DVDs and books.